Mitch Marner scored a pair of 3rd period goals, and the Maple Leafs scored four goals in the period, to beat the Rangers, 5-3, Saturday night in Toronto. The Maple Leafs have won four straight. The Rangers are now 3-6-3 in their last 12 games. Kevin Hayes and Neal Pionk each had a goal and an assist for the Blueshirts. The game was tied, 1-1, entering the 3rd period. Andreas Johansson gave Toronto a 2-1 lead 1:37 into the period. Morgan Rielly then made it a two-goal lead, 3-1, 5:26 in. Kevin Hayes scored his 10th goal of the season 68 seconds later, at 6:34, putting a Filip Chytil rebound in to make it 3-2. Midway through the period, Marner scored, off a pass from John Tavares, to make it 4-2 at 12:53. Chris Kreider deflected a puck in, at 16:19, to make it a one-goal game again, 4-3. Marner’s empty-netter with :19 to play provided the final 5-3 margin. Alexandar Georgiev got the start, and made 31 saves in the loss. Frederik Andersen stopped 25 of 28 shots and got the win. Marner [2G, 1A] and Rielly [1G, 2A] each had three points for Toronto. The Rangers [now 15-14-5, 35 pts] host the Flyers tomorrow night at The Garden. The Rangers scored twice in a 21-second span, in the final minute of regulation, to pull off a stirring 3-1 win over Anaheim, Tuesday night at The Garden. Kevin Hayes‘ shorthanded goal with 40 seconds to play broke a 1-1 tie, and Filip Chytil‘s empty-netter with 19 seconds to go iced the win for the Blueshirts. Vladislav Namestnikov recorded a goal and two assists to lead the Rangers. Alexandar Georgiev was lightly tested, making only 14 saves, but recorded the win. After a scoreless 1st period, Pontus Aberg gave Anaheim at 1-0 lead, at the 14:09 mark of the 2nd, shooting from behind the net and scoring his 11th goal of the season. The puck deflected in off Mika Zibanejad and past Georgiev. Midway through the 3rd period, Namestnikov tied the game for the Rangers, taking a pass from Brett Howden and beating Anaheim goalie Chad Johnson at 9:52 to make it 1-1. For several minutes after the Namestnikov goal, it looks like the Blueshirts would go to overtime for the 3rd straight game, but, with Chytil in the penalty box for a questionable goaltender interference call, Hayes beat johnson for his 9th of the season, off a pass from Namestnikov, a shorthanded goal that dribbled past Johnson and into the net for a 2-1 New York lead. Then Chytil, having come out of the penalty box, scored an empty-netter at 19:41, off a pass from Namestnikov, for his 6th goal of the season. The goal snapped a ten-game scoring drought for Chytil. The Rangers [now 15-13-5, 35 pts] play the Maple Leafs in Toronto Saturday night. Henrik Lundqvist made a season’s worth of highlight reel saves in a single game, but Alex Tuch scored 2:11 into overtime, to lead the Vegas Golden Knights to 4-3 win over the Rangers, Sunday afternoon at The Garden. The Rangers are now 2-5-3 in their last ten games. It was the third straight home game where the Rangers lost to a Western Conference team, by a score of 4-3, in either overtime or a shootout. The game was a seesaw affair. 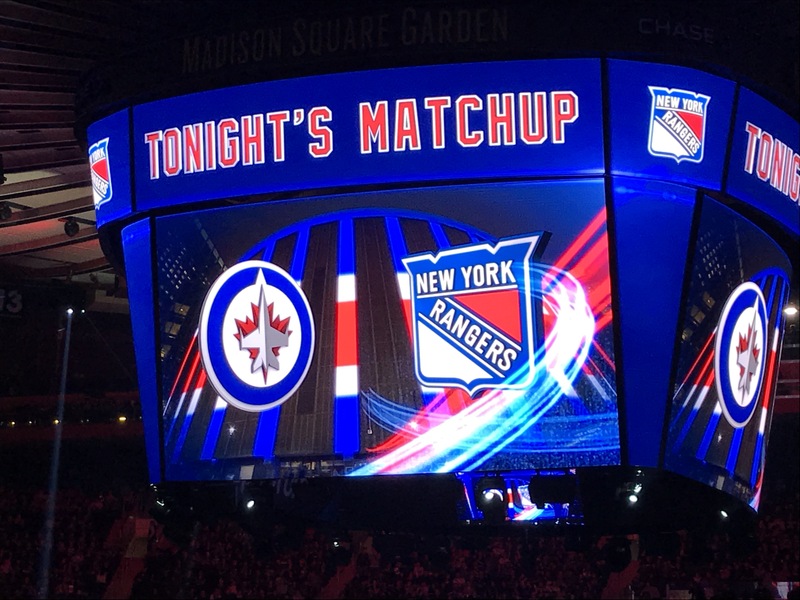 The Rangers took a 1-0 just 73 seconds into the game when Brady Skjei scored, off a nice pass from Pavel Buchnevich. But Reilly Smith tied the game, 1-1, with a power play goal at the 11:43 mark. In the 2nd, Paul Stastny scored his first goal of the 2018-19, off an assist from Max Pacioretty, to give Vegas a 2-1 lead at 6:09. But the Rangers got it back, midway through the period. Mika Zibanejad‘s slap shot, from just inside the blue line, beat Marc-Andre Fleury for a power play goal, tying the game 2-2 at 12:10. That fizzy good feeling of having tied the game didn’t last long; a turnover in the neutral zone gave Vegas a 2-on-1, and William Carrier took a pass from Tomas Nosek and scored to make it 3-2 at 13:22. Early in the 3rd, Chris Kreider essentially said, “I’m tired of trailing”, took a pass from Kevin Hayes, stormed into the Vegas zone, and beat Fleury for his team-leading 15th goal of the season, tying the game 3-3, with 16:31 to play. Neither team scored during the rest of the 3rd period, sending the game to overtime. A few minutes in, after a Mats Zuccarello shot was blocked, Stastny and Tuch got free on an 2-on-1, and Tuch beat Lundqvist for the game-winner. Kevin Hayes had three assists for the Rangers. Tuch and Stastny each had one goal and one assist for Vegas, while Colin Miller had two assists. Boo Nieves played his first game of the season. Adam McQuaid was back in the lineup after missing ht east 21 games. The Rangers [now 14-13-5, 33 pmts] host the Anaheim Ducks Tuesday night at The Garden. Former Ranger Derek Stepan scored two goals, including the game-winner in OT, as the Arizona Coyotes came-from-behind to beat the Rangers, 4-3, Friday night at The Garden. The Rangers are now 2-5-2 in their last nine games. For a long while, it looked like the Rangers’ power play would propel them to a victory. The Blueshirts got power play goals from Pavel Buchnevich, Kevin Hayes, and Mika Zibanejad, and held a 3-0 lead in the 2nd. Buchnevich, back in the lineup after missing 13 games, scored 4:01 into the 1st period to the Blueshirts a 1-0 lead. Hayes, off a great pass from Mats Zuccarello, made it 2-0 at the 17:26 mark with a power play goal of his own. It was Hayes’ 8th goal of the season. In the 2nd, Zibanejad made it 3-0 at 5:48, with the team’s 3rd power play goal of the night. But, similar to the home game December 2nd against Winnipeg, the Rangers watched a 3-0 lead evaporate. The Coyotes got on the scoreboard at 10:42 of the 2nd when Jordan Oesterle scored his 2nd of the season to make it 3-1. Then in the 3rd, Arizona rallied to tie it. Josh Archibald made it a 3-2 game, with 6:49 to play, off an assist from Stepan. And with 3:01 to play, Oliver Ekman-Larsson’s blistering snapshot found the goal, to tie the game, 3-3. In overtime, Stepan beat Henrik Lundqvist with just 32 seconds left, for the 4-3 win. Stepan now has 7 goals on the season. Hayes finished with a goal and an assist. The Rangers [now 14-13-4, 32 pts] host the Vegas Golden Knights Sunday afternoon at The Garden.